The IAM console includes policy summary tables that describe the access level, resources, and conditions that are allowed or denied for each service in a policy. 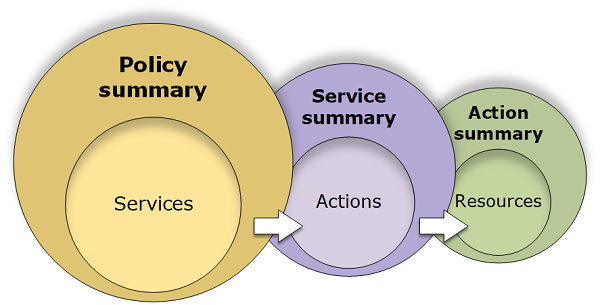 Policies are summarized in three tables: the policy summary, the service summary, and the action summary. The policy summary table includes a list of services. Choose a service there to see the service summary. This summary table includes a list of the actions and associated permissions for the chosen service. You can choose an action from that table to view the action summary. This table includes a list of resources and conditions for the chosen action. You can view policy summaries on the Users page or Roles page for all policies (managed and inline) that are attached to that user. View summaries on the Policies page for all managed policies. Managed policies include AWS managed policies, AWS managed job function policies, and customer managed policies. You can view summaries for these policies on the Policies page regardless of whether they are attached to a user or other IAM identity. You can use the information in the policy summaries to understand the permissions that are allowed or denied by your policy. Policy summaries can help you troubleshoot and fix policies that are not providing the permissions that you expect.